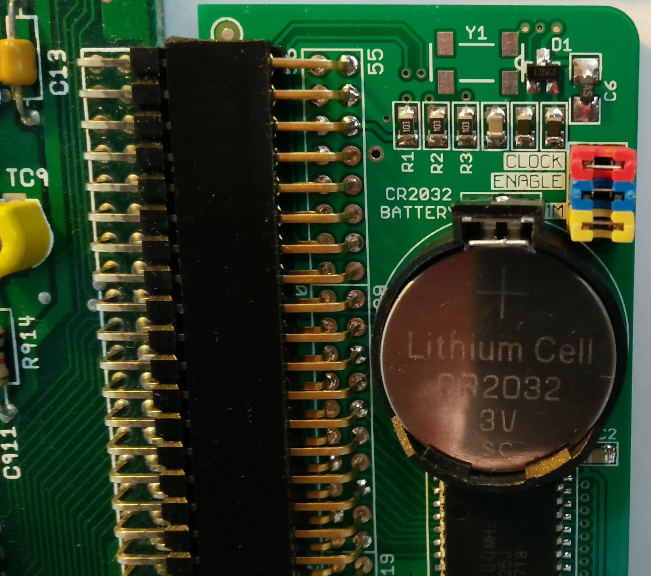 Here you can buy a modern re-creation of an Amiga 500/500+ trapdoor memory board. 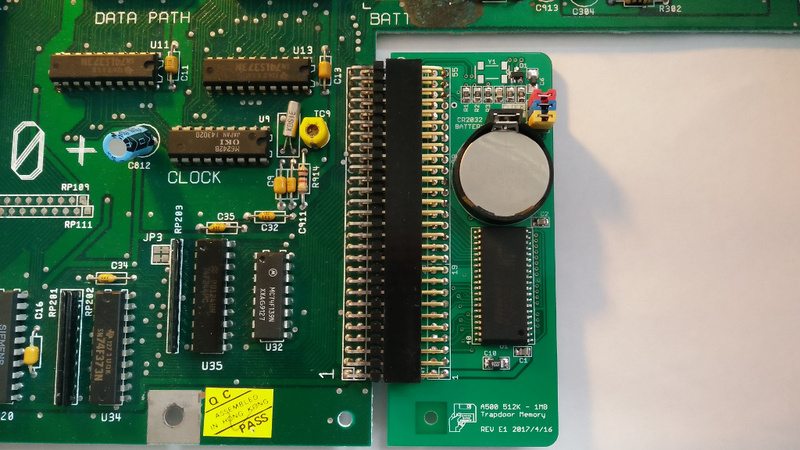 It is very similar in function to a Commodore A501 from the 1980s, providing 512 KB of memory and a real-time-clock (RTC). Many original A501s have become damaged from battery acid leakage, so a modern replacement is created here. 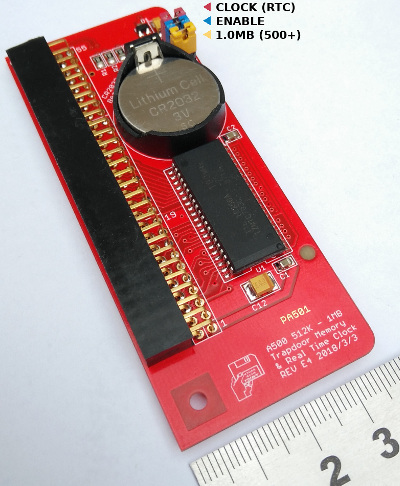 Optionally, you may order the 1 megabyte version, suitable for the A500+. 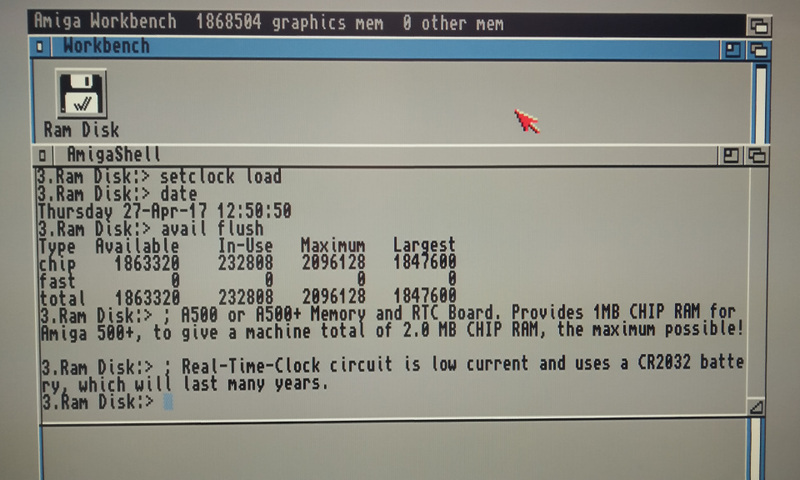 This gives a machine total of 2.0 MB CHIP RAM, the maximum possible. 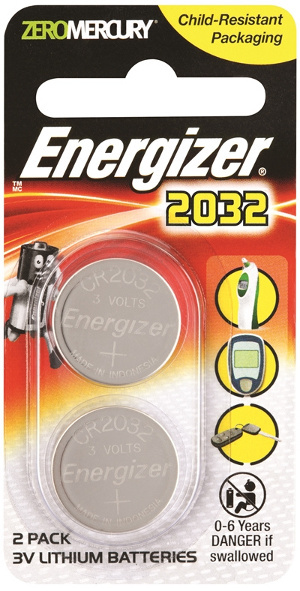 This board is sold without a battery, but it takes a very common CR2032 coin cell, which you can buy at any hardware store. I have put an effort into design and component selection to ensure the RTC uses a minimal amount of power. 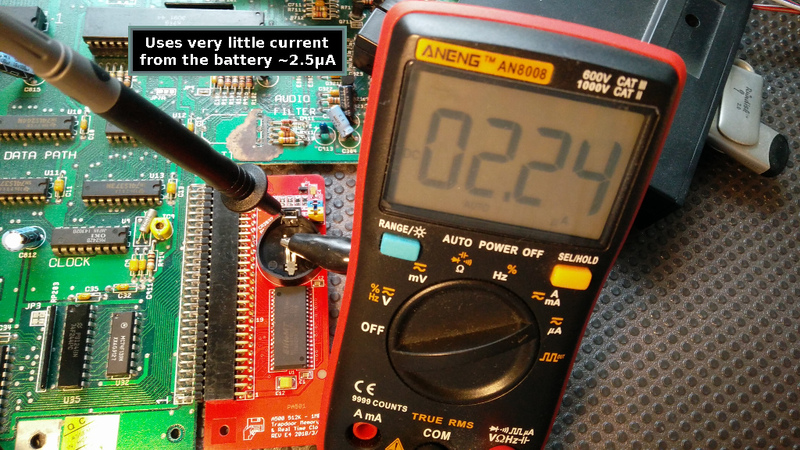 A good quality 240mAh lithium cell will last around 6 years! A battery is not required for the memory to work. Please read the important shipping information below, before making your shipping choice. Shipping by Airmail from Australia. Usually takes 1 week to the U.K. and USA, a bit longer to Germany. Please choose Standard Airmail if you are worried about it being lost in the post, it will add a tracking number, but at higher cost. If you select the Economy Airmail or Large Letter Post, please don't ask me to track your item, it's impossible! You just have to wait until it arrives. Australia: Posted by thin cardboard envelope and two stamps and a priority label. World wide: Posted in a bubble bag and has a barcode like UC0123456789AU. But, officially there is no tracking. Only suitable for quantity one to three. This is good for those on a budget and trust their national postal company. Never lost an item with this method yet! Parcel airmail with proper cardboard box. Has a barcode like UC0123456789AU. But, officially there is no tracking. Parcel airmail with proper cardboard box. Has full internet tracking and is approximately 2 days faster than Economy. 1 (RED) CLOCK Removing this jumper disables the RTC (real-time-clock) on this board. 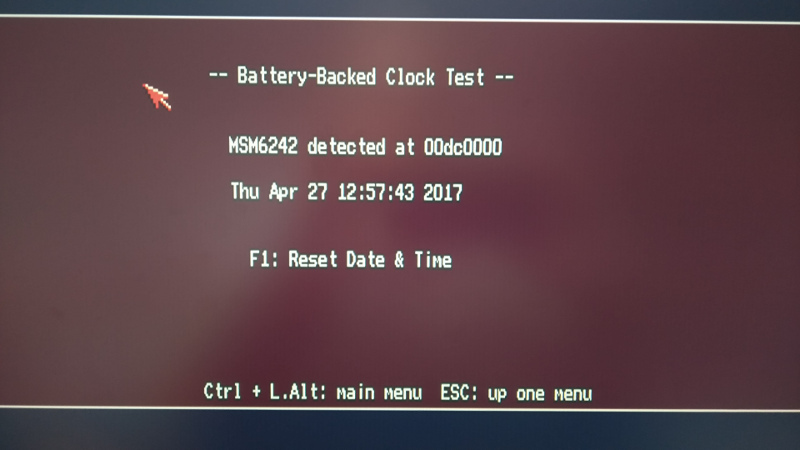 Do this if you prefer to use the clock on your A500+ motherboard. A normal A500 doesn't have an RTC on the motherboard. 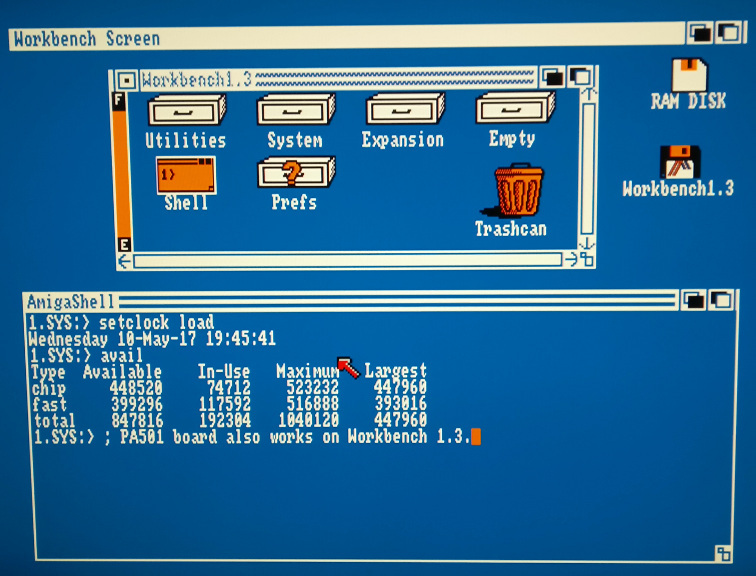 You can disable the A500+ RTC by joining JP9 on its motherboard. 2 (BLU) ENABLE A500: Makes the memory on the board act as SLOW RAM rather than CHIP RAM. 3 (YEL) 1MB A500: Keep it connected. A500+: Enables the extra 512KB memory for A500+. Removing this jumper will run a A500+ with a total of 1.5 MB CHIP RAM instead of 2.0 MB. Will the 1MB version work in a normal A500? ⇒ Yes, but the computer will only see 512 KB of the expansion board. Is a battery really required? ⇒ No, the memory works fine without a battery. Only the time and date will be forgotten. I have a 1 meg Agnus (A500 rev 6A) and want 1 MB CHIP RAM. How can I do that with this board? 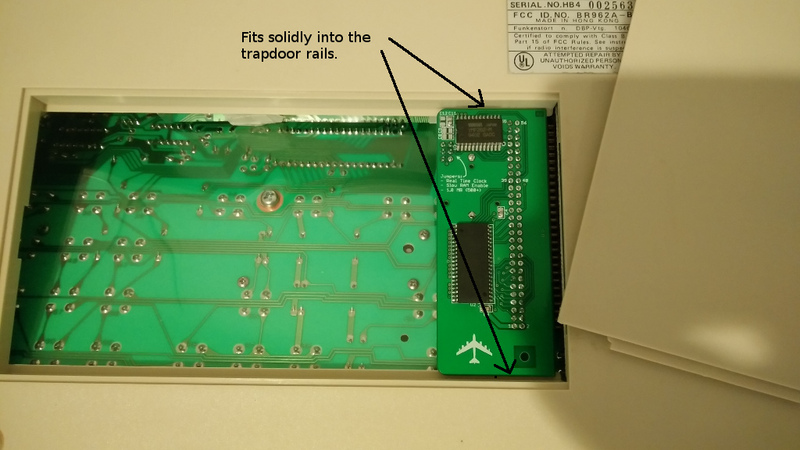 ⇒ You still have to modify JP2 on the A500 motherboard, as described on the internet. Modifying JP7A is not necessary, as the memory board has a jumper (blue) for this.